Hazuri Raagi Sri Darbar Sahib Amritsar was born on 3rd February 1970 in Gajjuagazi Gurdaspur, Punjab at home of Sardarni Ranjit Kaur and Sardar Mahinder Singh. Bhai Davinder Singh started doing kirtan at Gurdwara kandh sahib batala at very young age of 19. Davinder Singh ji then learnt classical and gurbani keertan from professor Ravel Singh ji. After his training he joined as assistant ragi in Sri Harmandir Sahib, Amritsar in 1994. After serving for six years as assistant, bhai Davinder started his own ragi jatha and has been serving sikh sangat since then. Right now bhai sahib ji�s raghi jatha is supported by Bhai Zabarjor Singh on harmonium and Bhai Harpreet Singh on tabla. Bhai Davinder Singh is serving as hazuri ragi at Sri Harmandir Sahib and performs the keertan there regularly.When not doing the keertan in golden temple, bhai sahib�s jatha is invited to do keertan across india. Also, sangat of america, russia, thailand, nigeria,south africa, canada and european countries have invited bhai sahib to their local gurudwaras to do keertan on many occassions. Sangat of New York awarded bhai sahib withgold medal in 2007 for his keertan and services towards taking the word of guru sahib forward. So far, 7 Albums have been released by Bhai Davinder Singh. 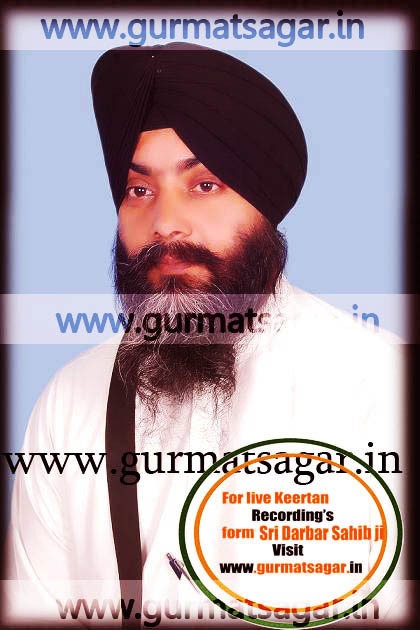 First Three albums �Jiyon Rakhe Tiyo Rahiye� , �Aisa Gur Wadbhagi Paya� and �Liv Layee� have been released by T-Series and following two albums �Tera Ant Na Jaana� and �Nirgunvantadiye� and "akritkhana nu palda" have been released by Frankfinn Music and "kirpa karo hare" by red records. All the albums are available in cassettes,audio cd, video cd,dvd and compiled in MP3 cds as well.